Laura Hubel/Boulder City Review Each week the coaches at Boulder City High School nominate an athlete to spotlight for contributions made to his or her team. 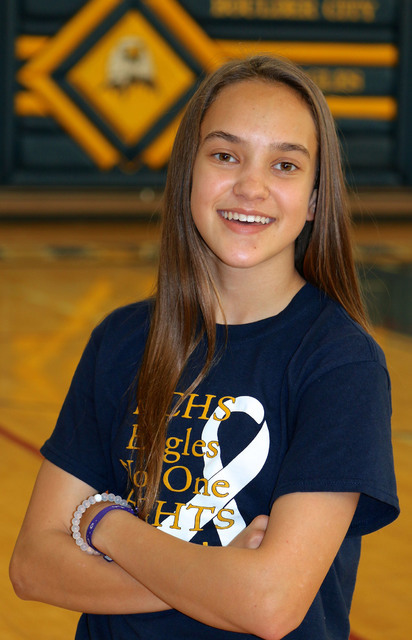 This week’s honoree is freshman Keely Alexander, who plays on the girls varsity basketball team. Coach Paul Dosch complimented Alexander on her leadership qualities as well as ability to score, garnering 18 points during the Lady Eagles' Jan. 10 game against Del Sol. She is the daughter of Enez Alexander and Jeff Alexander. Each week the coaches at Boulder City High School nominate an athlete to spotlight for contributions made to his or her team. This week’s honoree is freshman Keely Alexander, who plays on the girls varsity basketball team. Coach Paul Dosch complimented Alexander on her leadership qualities as well as ability to score, garnering 18 points during the Lady Eagles’ Jan. 10 game against Del Sol. She is the daughter of Enez Alexander and Jeff Alexander.